These days, especially if you watch or listen to the media, we’re surrounded by negativity. Unless you go on retreat, it’s kind of hard to escape. Sometimes one wonders whether there’s a “negativity vaccine” to be had! Well, so far as I know, there isn’t one. Exactly. Here’s how to make yourself immune to negativity. Some of this may surprise you, but work with me here for a while. It’s only energy seeking resolution. All that’s required is to find the harmonic that balances it. Move away from what feels bad or wrong to you, and move towards what feels good. Simple and effective. Align yourself with people and situations that don’t deplete your energy. You know who the energy vampires are; and you probably also know who always inspires you and makes you feel good just being around them, or reading their words or listening to their podcasts. Get more of those into your life and less of those who drain your energy. Once you’ve taken all the above steps, safeguard your freedom. Be careful who and what you allow into your mind, and into your space. You can clear the negative energy, but then you have to maintain and protect it, and do your best not to generate more of it yourself. Do the best you can to stay centered and in “observer” mode. Stay neutral and stay in your heart. Reach out to someone else; it’s kind of hard to feel down about yourself when you’re lifting someone else up. Even though you may be tempted, don’t jump in to any drama — your own or anyone else’s. 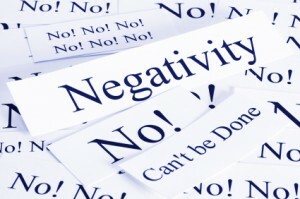 The ways to invent a negativity vaccine for yourself aren’t complicated. But they do require your determination and consistent effort. After all, your immunity depends on how easily you can be infected! So fight it off and stay strong. You may also be interested in a related post I wrote last year: Hate Is A Disease. Let me know what else you do to stay immune to negativity!